The section of the thesis outlines the approach, path, and concept for the study. The introductory chapter includes the study rationale followed by the aims and objectives as well as the research. The study identifies the rationale to support the study’s relevance. The aims, objectives and research questions show the target and scope of the study. The thesis outline is also highlighted in the chapter to describe the contents of the paper. Currently, Oman faces accelerated development in infrastructure, with large percentages of Oman’s national income channeled to improve this aspect of the country. Infrastructure development aims to support the current drive by the Government to diversify investments in the energy sector and generate new strategies for generating income (Elattari, 2014). Today, the energy sector consumes billions of Oman Rials in expanding and developing the energy industry, especially oil and gas. The negative impact of expanding oil and gas industries relate to pollution resulting the nature of their activities, their sheer size, and location. Polluting outputs from the industries often affect coastal waters, soil, and underground air as well as water. The negative impacts of these factors on the environment include accelerated rates at astronomical levels with the slow and gradual accumulation of these factors having disastrous effects on the health and safety of future generations in the years to come (Elshorbagy, 2005). The nature of activities in oil and gas sectors in Oman and the inadequate control over the activities make environmental protection an issue that managers rarely consider and contemplate despite its disastrous effects on Oman citizens. Even with the progress in infrastructure development, environmental management is neglected on responsibility lists at any level of management or lower employee levels as investors concentrate more on infrastructure than on health (Elshorbagy, 2005). Poor practices from the environmental viewpoint include open-air blasts that create room for constructions, which provoke complaints from employees and sustainability stakeholders as a nuisance for health. The negligence in managing and controlling environmental factors and effects of oil and gas activities spurs the proposal on the implementation of EMS in Oman. To examine the magnitude of the problem, the dissertation will identify organizational and environmental shortfalls that require a strategic intervention to enable change for operational and environmental improvement. The case study will use Oman Oil Company S.A.O.C. (OOC) as the chosen company to investigate the common implementation factors facilitating or hindering the success of EMS implementation in Oman. Oman Oil Company S.A.O.C. (OOC) is a government owned company that pursues investment opportunities within and beyond the borders of Oman. The company explores and produces oil with its numerous assets and diversified interests in the energy sector. This study has chosen the company to reveal the environmental management systems that have helped the oil and gas company in Oman to adapt to changes and adopt best practices to its operational systems. What follows is an investigation of challenges facing the management’s efforts at Oman Oil Company S.A.O.C. (OOC) to understand current practices in Oman’s oil and gas sector. Finally, the dissertation will research the utilization of EMS as a strategic tool to optimize the environmental and operational performance of Oman oil and gas industries while considering the recommendations, from which Oman Oil Company S.A.O.C. (OOC) may benefit. However, it is necessary to note that no person other than your supervisors will see the content of the dissertation. The global nature of the oil and gas industry affords it operations all over the globe (Friedman, 2003). The global community relies heavily on oil and gas supplies with meeting the world’s energy demands being the greatest challenge. Added to the challenge is rooting out the adverse impact of the industry on the environment by aligning operations with current best practices. However, exploiting oil and gas is not without ecological side effects given the records of water pollution from oil spills, damaged lands, accidents, fires, and air pollution (Laboy-Nieves, Schaffner, Abdelhadi & Goosen, 2008). Recently, the social impact of operations in remote areas have attracted attention with the oil and gas industry working hard to tackle environmental protection. Whereas much has been achieved, the industry recognizes the need to do more. Conferences on environmental development focus on the close ties between socio-economic development and the environment (Hottentot, 2006). The central message of the meetings is that independence and cross-sector partnership offers a plan of action for tackling the wide-ranging socio-economic and environmental issues facing the global village. Although individual disparate problems have been addressed in the general global context, translating structural issues into national actions plans has a strong influence on the national policies concerning environmental management. Environmental issues facing oil and gas exploration as well as production exist at the local and global levels (Hottentot, 2006). These include protecting the habitat and biodiversity, air emissions, water discharges, oil spills and incidences, and soil or groundwater contamination. Petroleum and gas sectors have responded to the challenges of ensuring that operations conform to best practices. The evolving environmental agenda considers the emphasis the industry places on establishing efficient environmental management systems to integrate environmental issues as core components of the corporate culture (Zutshi & Sohal, 2004). The issues of health, safety and the environment are often pooled together in the quest for best practices. Exploring and producing oil and gas in Oman has numerous potential effects on the environment (Friedman, 2003). In the context of Oman, the effects often depend on the state of each process, the size and complexity of projects, the sensitivity of surrounding environments, effective planning, efforts implemented to prevent pollution and the control and mitigation strategies employed at each phase. The identified impacts are probable and can be avoided, minimized or mitigated with appropriate care. The oil and gas industry in Oman has been preoccupied with proactively developing management systems to minimize environmental impacts and to reduce the number of environmental incidents. As such, this dissertation will investigate the environmental management systems (EMS) that currently exist in oil and gas companies in Oman. Given that EMS systems can improve the environmental and operational performance of Oman’s oil and gas companies (Alabri, 2014); the research will investigate the recommended EMS level necessary for the progress of Oman oil and gas companies. The research aims to critically investigate the current practices of environmental management systems at an oil and gas company in Oman. To accomplish the research aim, the study examines factors identified in the literature review and other salient factors facilitating EMS uptake in Oman besides the usual level of implementing EMSs. The results of the study should be replicable to other similar sectors in the Middle East. Steger (2000) asserts that the Government is responsible for tackling pollution related concerns and environmental initiatives in Oman’s oil and gas sectors. Considering the difficulties that Oman Oil Company S.A.O.C. (OOC) faces will guide the research aims of the proposed study. The following research objectives will help support the study aim. This study adds depth to the perception of EMSs by exploring environmental management in Oman and not the trends in pollutant levels. The approach will encourage similar studies to fill the gap in EMS literature specific to Oman. This will be achieved based on knowledge of the status of environmental management status and experiences of major oil and gas companies in the country. The research seeks to fill the literary gap on the challenges facing the company’s role to protect the environment and encourage better environmental management. Adding to the existing knowledge of EMS implementation factors and benefits it has to the oil and gas industry will fill literary gaps in understanding EMS adaptation and adoption to ensure it is a success. The dissertation focuses on encouraging the adoption of comprehensive EMS levels in the oil and gas industry as well as other sectors. The study also adds to the limited understanding of organizational hindrances to ensuring successful EMS implementation to gain from the knowledge, which may be replicated in other industries. This section is a logical data presentation of several secondary literatures. The chapter, which often is exploratory in nature, employs case studies to define the context of the problem under study. The aims and objectives of the study are covered in-depth to ensure that any reader is furnished with information on the topic. One cannot deny EMS its position as an ISO 14001 system used in managing the environmental impacts of industry and service sectors (Wiengarten, Pagell & Fynes, 2013). EMS as a strategic tool is selected for this case study because of its value in improving ecological and operational improvements. Evidence shows that activities in the energy industry are a source of contamination to nearby villages and adjacent coastlines that will continue increasing the risk it poses to the natural environment without a meaningful intervention (Davorin, 2013). As the coastline increasingly adopts the growth in larger new vessels, increased personnel, and on as well as off-shore oil and gas drilling, the effects of pollution on Oman’s ecosystems will intensify along the coast, albeit with little investigation and documentation (Elshorbagy 2005). The concerns identified above make it imperative to study the issues causing operational performance problems and the level of environmental management along the coast. Studies (Alabri, 2014; Elattari, 2014) show that energy companies working along the coast of Oman have implemented voluntary management systems to improve their environmental performance. Although the studies on the different aspects of implementation show conflicting opinions (Alabri, 2014), the benefits of EMS in surpassing environmental management, spillover concerns, economic returns, and operational performance make this an exciting tool to study. Zutshi and Sohal (2004) assert that the practical implementation of EMS allows organizations to develop capabilities such as improved skills, technical, and managerial systems that offer competitive environments for improving environmental performance. The arguments supporting the systems are too detailed to ignore (Zutshi & Sohal, 2004; Tinitinalli, Cameron & Holliman 2010). Ramos et al. (2007) assert that major institutions should initiate environment management practices and reflect on the aspects of EMS that make them a competitive advantage. The representation of EMS as an ISO 14001 (Ramos, Alves, Subtil & de Melo, 2007), encourage this study to choose the system as the strategic management tool that may improve environmental operations in Oman’s oil and gas industry. This makes it necessary to review knowledge of environmental management at the early stages of the research such as its objectives, components, benefits, and hindrances to identify the motivations for implementing EMSs and the perception of its efficiency. Sustainable practices in Oman’s environments are inseparable from operational management of the environment. Numerous elements of any organization such as the setup, the personnel and structure affect the natural environment in more than one way (Gonzalez-Benito, Lannelongue & Queiruga, 2011). The elements of EMSs give readers a better understanding of the problems, which the adoption model for EMS can help solve. A review of the elements is needed to gain knowledge of why EMSs elements can succeed in becoming tools for delivering the required excellence in the Oman environment. Given that the success of any EMS varies depending on several external factors not outlined in the structure and guidelines of EMSs, the industry wide accepted elements will give an overview of what Oman requires to succeed in its environmental sustainability efforts. This stage of the research defines the elements and presents them in this section. Since effective commitment and policy alone fails to provide assurance that environmental performance meets legislative and corporate requirements or best practices, efficiency requires the integration of formal management activities to address the desired environmental performance including the principles in the above table (Ammenberg & Hjelm, 2002). The model of EMS represented above includes seven key elements. The EMS model is compatible with the requirements of the ISO 14000 series with the ISO 14001 acknowledging that most companies have integrated EMSs all over the globe. However, the ISO 14001 standard fails to address occupational health and safety management and does not prevent organizations from including the issues into their EMS. Whereas many companies will have the outlined EMS model, effective integration of the management systems requires an analysis of current practice and commitment, which implies good communication within the organizations (Zeigler & Nogareda, 2009). The common starting point of any management systems is reviewing existing situations and practice by initiating the highest level of management and involving the total commitment of senior managers. Committing to and demonstrating continuous improvement is critical to ensuring effective and maintained management. Under the EMS, it is necessary to establish standards, program, practices, guidelines, and goals agreed upon by regulators and other stakeholders (Zeigler & Nogareda, 2009). Monitoring and auditing will show operational performance and provide effective measures. Since most companies in Oman operate under different climatic, geographical, and socio-political situations, the legislative frameworks, socio-economic and physical infrastructures are highly sophisticated or non-existent. As such, companies require a consistent management approach for allowing flexibility to adapt to sophisticated existing infrastructure (Zeigler & Nogareda, 2009). The application of the management system to contractors, suppliers and consultants has to be factored since the service and fieldwork of oil and gas industries is often led by non-company personnel. Therefore, effective communication, monitoring, audit, and reporting are needed between service suppliers. The senior management of oil and gas companies need to provide strong and visible leadership and commitment to ensure that the commitment streamlines to the resources needed in developing, operating and maintaining EMS and attaining the strategic objectives of policies (Iraldo, Testa & Frey, 2009). The management has to ensure that the policy requirements of EMS are accounted for during operations and that support for local actions is provided to protect the environment. EMSs often require companies to document their environmental policies as well as strategic objectives to ensure that the policies correlate with the objectives of each company (Johnstone & Labonne, 2009). The foundation of the assertion is a commitment to defining and implementing corporate strategies to protect the health and safety of individuals and the environment and respond to the concerns of communities and developing partnerships with stakeholders. The policies are implemented, maintained and communicated to employees and the public with the company committing to meeting and exceeding the relevant regulatory requirements to apply responsible standards whether laws and legislative requirements exist or not (Tinsley & Pillai, 2006). An EMS commits companies to setting EMS objectives and continuous improvement efforts on its performance in areas such as reducing the risk and hazards to environmental health to low standards as reasonably as it is practical (Johnstone & Labonne, 2009). Companies have to maintain procedures for identifying the hazards and effects arising from activities or materials they use (Al-Tuwaijri, Christensen, & Hughes, 2004). The scope of identifying this encompasses all activities beginning from the inception to decommissioning stages. Assessing the effects of environmental impact assessments should be formalized and each step undertaken depending on the situation. Preliminary screening and scoping identify the depths required for risk management even as other companies view environmental impact assessments as regulatory hurdles. However, it should be noted that the tool is a regulatory hurdle with the potential for streamlining the operations of any company (Al-Tuwaijri, Christensen, & Hughes, 2004). Environmental assessments begin during the pre-planning stages of each project and continue iteratively to the feasibility, detailed design, construction, and operations. The findings are then integrated into the next phases of the project design. Environmental risk evaluation and risk management begin at early stages of environmental management with the concepts being well founded in oil and gas industries as safety management components. The findings of evaluations and risk management studies are integrated into planning process (Galdeano-Gomez, Cespedes-Lorente & Martinez-del-Rio, 2008). Incorporating the results of each assessment and developing environmental plans and programs unique to the each environment are included as guidance measures for preventing and minimizing the negative impacts of possible beneficial impacts. The results also set internal standards and targets for controlling wastes, specifying site-operating procedures, fostering consultation, and communication program, while recommending monitoring programs for each project (Galdeano-Gomez, Cespedes-Lorente & Martinez-del-Rio, 2008). Compliance programs that enforce statutory requirements are included with the relevant environment that is not often added into site environmental manuals. The impact and need for decommissioning are included during the project-planning phase with the restoration plans developed before the field life ends. Environmental specialists support the development of programs during the planning process with implementation responsibility resting with line managers who understand the commitment employed into the study (Esty & Winston, 2006). The commitments include legal and statutory controls on operations and cooperate commitment to responsible management of the environment. Monitoring confirms the commitment driving the implementation phase with preventive approaches to management ensuring that results and conditions are forecast at the planning stage. Monitoring also verifies evaluations during the planning to pinpoint the causes and implemented remedy for the action identified. Environmental auditing is a tool, which comprises systematic and periodic evaluation of the performance of organizations, management, and equipment to help safeguard the environment (Esty & Winston, 2006). The process facilitates the management control of environmental initiatives while assessing compliance with company policies to meet regulatory requirements. Reviews and audits are essential management tools with critical value at the operational level for verifying and offering feedback on effective organizational systems and environmental performance. Audits substantiate and verify monitoring and compliance programs to ensure the effective functioning of environmental plans, procedures, and standards. Esty and Winston (2006) add that audits create internal and external awareness while adding credibility to the company’s commitment to environmental activities through demonstrated commitment to achieving effective environmental management. Companies are now preparing their environmental audits to cover public leaders such as shareholders and financing companies and company employees benefiting from the environmental position of any company. The energy industry is striving to achieve profits while satisfying customers and business associations by making profits, meaning that the economic drive may push some to prioritize particular components of each organization (Karapetrovic & Casadesus, 2009). Contrastively, tougher economic climates fail to register environmental management and control as a top priority agenda. The decision affects the business in the short and long term, meaning that external pressure from regulatory bodies may be the push needed for the organizations to give in. Regulatory pressure is essential in any industry to ensure regulatory compliance through maintained law revisions, legislative updates, and strict enforcements. This is valuable apart from the right attitudes, awareness of hindrances, and mitigation methodologies (Karapetrovic & Casadesus, 2009). Oman has a severe lack of research in the area with the absence of knowledge of the motivations spurring environmental efforts requiring a keen study. Numerous organizations all over the world have raced to implement EMSs as components of their management systems with not less than 250,972 ISO 14001:2004 being issued by the end of 2010 (Alabri, 2014). Ecological awareness has evolved into a leading social concern with its management becoming a strategic objective for every company. Over the recent years, public administrations and service providers have been motivated to adopt EMSs with the focus on managing environmental performance and overall management performance. In Oman, oil and gas firms are increasingly overcoming their diverse organizational structures and characteristics by asserting their positions as socially responsible companies with environmental concerns being an essential component of their daily operations (International Business Publications, 2009). With the race to adopt EMS growing faster, the important factors pushing Oman organizations to pursue the path and the benefits they seek and achieve are worth considering. Despite the different resources and aspirations, the desire to improve environmental management remains common. Wiengarten, Pagell, and Fynes (2013) assert that motivations are common as companies seek to reduce the environmental impacts of their supply chains. EMS was birthed to respond to pressures and not a target for expected benefits. However, many organizations all over the globe still feel the pressure with the key factors triggering managers to adopt EMS into their operations. Oil and gas companies realized the value of EMS to the environment and the organization gave in to tempting drivers to embrace and speed up EMS implementation. According to Zutshi and Sohal (2004), the factors include market drivers such as future growth markets, growing trends in green consumerism, technological, differentiation, and first mover advantages. The second group of social drivers includes public opinion, green politics, shareholder expectations, community pressure, and media attention. The third group of financial drivers includes socio-ethical investments, protection from liability, insurance coverage, planning failures and credit ratings (Zutshi & Sohal, 2004). The last category of drivers includes regulatory drivers such as national green initiatives, environmental regulations, self-regulations, and green trade. The broad categories received support from researchers who acknowledged these as the driving factors motivating the uptake of EMS implementation. Most companies quote a mix of these factors with many arguing for stakeholder pressure to implement EMS as a predictive power regarding the company’s environmental behavior (Gonzalez-Benito, Lannelongue & Queiruga, 2011; Morrow & Rondinelli, 2002; Pondeville, Swaen & De Ronge, 2013). The authors add that stakeholders motivate proactive reception of various environment management systems. However, other authors (Berrone & Gomez-Mejia, 2009) assert that economic incentives of EMS are critical amongst manager’s choice to follow environmental strategies to achieve legitimate institutional fields. An inquiry into the manufacturing industry in Spain linked commercial motivations with the image and products of the companies that led to the prioritized allocation of perceived transformations (Gonzalez-Benito & Gonzalez-Benito, 2004). The study concluded that the weight of commercial motivations pushed forward the transformation of managerial systems. Similarly, operational motivations link to deeper transformations that alter the manufacturing of products. As a result, the motivations link to transformed operation systems. Attitudes associated with environmental liabilities and responsibilities link to the increasing legislation and stakeholder pressure that strongly emphasizes high environmental quality standards motivated by cost, director’s liability market opportunities, consumer pressure and local community banks (International Business Publications, 2009; Berrone, Luis & Gomez-Mejia, 2009). Unprecedented is the concern that most companies do not care about protecting the environment or seek to protect it as Wooldridge and Couper (2006) note. The findings cohere with those of other researchers. For example, Karapetrovic and Casadesus (2009) note that the sequence of adopting an implementing an EMS initiative links to the simplicity of a chosen system to an organizational situation. Companies are pushed to adopt management systems with fewer burdens on their current operations. These studies shift from the traditional probing of earlier factors since they present the causes and relational aspects that differentiate between the needs of various organizations (Karapetrovic & Casadesus, 2009). Oman’s energy sector has initiated environmental management schemes as a response to the pressure from non-governmental organizations as well as campaigns from the public and activists. The pressure has piled significant pressure on the oil and gas industry, with the power of the media being the most efficient (Jukneviciute, Liubiniene & Thunqvist, 2011). The media has piled pressure on the industry to protect the environment and to prevent pollution, by pushing for the uptake of EMSs. Given the unparalleled role of the media in influencing contemporary social matters, it has informed and educated the oil and gas industry by providing open access to information that allows for better understanding of issues relevant to the environment. Jukneviciute, Liubiniene, and Thunqvist (2011) attribute public pressure to the media’s coverage of environmental concerns to account for the existing differences in EMS uptake by companies. This makes it interesting to question in-depth the influence of Oman media in pressuring matters of environmental concerns. As establishments gain interest in EMSs and many countries, voluntarily choose to adopt and establish the systems in their managerial processes (Morrow & Rondinelli, 2002), most EMSs in Oman are implemented according to the international ISO standard 14001. Numerous organizations choose third party certifications while others lack the motivation for achieving any certification. Conflicting opinions on the factors show that the level of implementation needed from organizational, environmental and economic perspectives are required to make a difference (Pondeville, Swaen & De Ronge, 2013). This section identifies the benefits of EMSs that considering critical elements that make the system feasible. Whereas organizations respond to pressure, benefits from successful implementation of EMS motivate them more to consider their uptake (Tinsley & Pillai, 2006). The success of EMSs (or ISO 14001) links to primary and spillover benefits. The primary benefit is managing and controlling activities to reduce their environmental impacts. Studies show that the spillover effects that organizations gain encourage EMS implementation as a component of their operations. Case studies from Norway show that optimizing few processes to reduce pollution results in improved products from EMSs adoption. Zutshi and Sohal (2004) summarize the benefits as cost reductions from minimized waste, reduced power, gas, water, and raw material use, improved operational process from the cost savings, improved organizational communication, better insurance, improved relationships with suppliers, and reduced fines for regulatory compliance. Research by Kjaerheim (2005) support these findings, arguing that environmentally oriented production motivates positive preventive action and promotes the holistic view of resources, production, economy, and the environment. The focus on environmental management influences optimization and assurance of legal compliance. A study by Alabri (2014) on the Oman context reveal that improving regulatory compliance, legal certainty, improved documentation, employee awareness, and efficiency are the reasons for implementing and certifying EMS. The legal guidelines that have been instituted in Oman include the regulation requiring permits or no environmental objection letter and an environmental impact assessment for any projects or facilities to determine their potential to cause pollution (Bin Said, 2001). The Royal Decree RD 10/82: Law for the Conservation of the Environment and the Prevention of Pollution offers a framework for environmental protection in Oman. At the managerial level, Lopez-Gamero, Molina-Azorin, and Claver-Cortes (2010) assert that the competitive positions of organizational management also link to improved market reputations, green product development, and voluntary environmental strategies reflecting the personal concern of management for the natural environment. The competitive advantage of each oil and gas company reflects the personal concern of managers to their environment, meaning it has a positive financial performance. The consequences of EMS for the Oil and gas industry do not differ from the highlighted as the industry moves towards realizing the benefits of their implementation efforts (Chan, 2008). Gaining knowledge of environmental issues and performance, better loan and insurance conditions, cost savings, and improved reputation from local communities affirm the organizational performance aspects such as quality, reliability, and flexibility. With the knowledge, companies are better positioned to offer ecological supply chain management, adequate recycles, and improved logistics systems. As novel communication technologies such as the Internet arise, masses are turning to them as sources of information over the traditional media from their low costs, rapid communication, the absence of national boundaries, and freedom from government monitoring. Researchers (Stokols & Montero, 2002; Pickerill, 2003) document the role of the Internet in creating awareness and enhancing environmental activism. The role of the media and the Internet, especially the social media in disseminating messages to the wider public and promoting the interest to change is not yet visible at the political level in countering pollution and environmental protection. More work should be spent to direct the tool and make it effective in disseminating awareness and pollution prevention (Pickerill, 2003). The public is tasked with communicating deficiencies, expressing communal views, displaying recommendations, and piling pressure on policy-makers to counter pollution sources. Oman could learn from Western and Eastern countries where media outlets pile pressure on industries and governments to manage their environment. The regulatory frameworks under regional regimes help in understanding the development of Environmental Management Systems in Oman. National authorities are tasked with controlling and enforcing regulations strictly (Laboy-Nieves et al., 2008). In Oman, national authorities implement international requirements through primary legislations supported by subordinate rules and guidelines detailing the specific requirements needed. Examples include the Royal Decree No. 114/2001 that issues the law on conservation of the environment and prevention of pollution. The regulations are refined by standards and consents that determine the quantitative controls of emissions to which Oman prescribe upon reaching a negotiated agreement and set goals. The traditional prescriptive legislation in Oman is today complemented by performance assessments, set goals, negotiated agreements and self-regulatory approaches (Alabri, 2014). The new systems require consent, control planning, development and operational conditions before go-ahead is granted. The consents are increasingly based on the findings of environmental impact assessments. The typical factors that push for the effective application of environmental legislation in Oman mirror those of the Middle East. They include the right international and national laws, organized decision-making activities, legislations with clear responsibilities and liabilities, enforced standards of operations, performance reporting, proper consultation and appeal procedures, and the sanctions and political will facilitating enforcement (Davorin, 2013). The challenges that hinder the government’s efforts to counter poor environmental practices in the oil and gas industry make it essential to investigate the approaches in the oil and gas sector that hinder effective management of environmental performance (Alabri, 2014). The status of environmental management in Oman is important in this aspect of the research to identify EMS initiatives of major players in the oil and gas industry practice to identify success implementation factors. This will fill the gap of research in managing environmental concerns in oil and gas industries in Oman. This stage of the research considers environmental, organizational and operational problems and is based on the first research question. Even where Oman organizations engage in similar activities, such as the oil and gas industry, the inability of some organizations to implement and sustain EMS suggests that the systems may not suit all groups (Berrone, Luis & Gomez-Mejia, 2009). Particular organizational factors and measures require consideration in the successful or failed implementation of EMSs. As such, this stage of the research identifies these factors. The benefits from implementing EMS may vary in quantity, but cannot be separated from the factors that may hinder their initial implementation (Balzarova, Castka, Bamber & Sharp, 2006). These studies record the lack of guarantee that the path to successfully implementing EMSs requires organizations to overcome certain obstacles and challenges. The challenges, which often appear as too significant to overcome, outweigh the desire to implement EMSs. The initial challenges outweigh and obscure visions of motivations and benefits, thereby bringing the EMS plan to a halt (Chan, 2008). Other organizations with already established EMS fail in maintaining it due to the obstacles impeding its effective implementation and leading to EMS loss. Researchers have labored to understand the type, magnitude, or stage of encountered obstacle, to determine the best proposals for implementing EMSs in Oman (Alabri, 2014). A comprehensive coverage of the barriers to implementation includes industrial barriers such as capital costs, configuring current operations, competitive pressures, and industry regulations while organizational barriers include poor communication, best practices, lack of support from top management leadership and negative employee attitudes. Researchers such as Zutshi and Sohal (2004) complement the list of obstacles to implementing the systems to the sectors. The barriers may be expanded upon to include ecological consciousness among top managers and managerial teams, poor knowledge of laws on environmental protection, low wages relating to environmental protection, lack of awareness of the benefits of EMS implementation and inadequate knowledge of possibilities for obtaining pro-ecological investments. In Chan’s (2008) survey, findings note that the differences between two industries regarding their activities and pollution impacts are significant, yet the barriers have notable similarities, which may include the absence of knowledge and skills, professional advice, and resources and the uncertainty of outcomes. Measures that most companies take in overcoming the obstacles at the planning and implementation phases of EMS include communicating the aims of EMS, conducting training and awareness programs for employees, receiving employee feedback, using supplier’s knowledge and experience in meetings, and encouraging feedback as well as suggestions. However, Chan (2008) insists that implementing EMS is a course of correction where barriers are removed after organizations begin implementing EMS. This transforms EMS into a cure for any obstacles it brings up. Organizational culture defines individual symbolism, myths, interpretation of events, ideas, and experiences that groups within our societies influence (Alvesson, 2002). It encompasses the assumption of social reality to guide organizational behavior and to represent organizational operations. The culture of each organization makes sense of events taking place in each organization and cultivates a powerful influence affecting organizational success (Helms-Mills, 2008). Altering operational cultures present the most challenging issue for most organizations in environmental management. The challenge often entails implementing new management systems requiring a major change in internal cultures that shifts from compliance to active environmental stewardship. The EMSs (ISO 14001) standard changes the internal culture of the oil and gas industry by fostering understanding and commitment that enables the sector to be sensitive to the environment in ways that did not exist before. As a result, organizations in the sector learn the numerous change and management processes. The transformation is not achieved overnight but is a long-term improvement of the sector to achieve set goals. Despite the interesting relationship between organizational culture and its relationship to environmental management, ways of taming their influence on the other are rarely covered in works of literature. Results focusing on business contexts acknowledge the value of a positive corporate culture as an element of success. The results of the business context may be merged with aspects of EMS to achieve success in implementation efforts. Since incorporating EMS into the decision-making process of organizations as central management systems can improve program management and environmental performance, Balzarova, Castka, Bamber and Sharp (2006) outline organizational culture dimensions that may help in implementing and maintaining the ISO 14001. The dimensions cover the present industrial culture using evidence of persons, structures and the environment prioritizes critical areas and conducts an analysis of the strengths and weaknesses of the industrial culture upon implementation. It is necessary for the plans to transition to the desired culture, align the ISO 14001 program to the prevailing industrial culture, and build an EMS on environmental aspects using an impact assessment. The outlined recommendations help in assessing corporate culture and implementing corrections and alignments that may spur positive change. As such, studies agree on the value of industrial culture in increasing the possibility that new EMSs may be set up successfully. The challenges of industrial culture and the obstacles hindering successful EMS implementation urge for effective measures for improving the conditions facilitating the successful functioning of systems. Systematically implementing components of EMSs is inefficient, meaning that extra measures need to facilitate success (Esty & Winston, 2006). Oman companies are wary of environmental management systems because some environmental investments tend to pay off while sometimes the initiatives fall flat. Others tend not to deliver the promises in environmental gain while others may work of fail from economic perspectives. The competitive climate of today’s environment means that commitment to the environment may vary from oil and gas companies even though they are the most important variables whether organizations practice them or not. Companies may choose to be reactive in their efforts by implementing the proposed regulatory requirements or proactive by initiating measures that reduce the impact they have on the environment. Many companies often engage in adoption from a proactive perspective with most companies believing in demonstrating their commitment to protecting the environment. The proactive nature of environmental protection goes past incorporating environmental concerns into normal strategies but includes all aspects of life and behavior where leaders take up most of the responsibility (Laboy-Nieves et al., 2008). The tasks involved in tackling the challenges are complex but provide the necessary move for successfully instituting change programs. Furthermore, corporations that pursue proactive responses are inspired communities with sensitivity and responsiveness to stakeholder needs. Given that pro-activity combines deeds and practices, the practices of Oman companies align with formal EMS components to strengthen the continuous process of implementation (Alabri, 2014). The oil and gas industry in Oman notes different factors that it has to consider to successfully implement ISO 14001 such as integrating systems processes and practices while supporting implementation through involving employees that the change process affects and communicates progress and goals. The International Business Publications (2009) reports on the positive efforts of oil and gas industries in Oman by the management’s commitments to all proactive initiatives in the oil and gas industry. The commitment by top management is a motivating factor when investing in proactive environmental management supported by environmental values and behaviors that push for green cultures and incorporation of environmental concerns in all organizational structures. Galdeano-Gomez, Cespedes-Lorente, and Martinez-del-Rio (2008) link the positivity to performance and argue that companies can only be better at environmental management where the resources are a competitive advantage and a positive ecological and financial performance. Various kinds of literature present conflicting arguments on the value of EMSs in forming competent and comprehensive systems for managing the environmental performance of firms (Morrow & Rondinelli, 2002; Pondeville, Swaen & De Ronge, 2013). Whereas numerous publications favor EMSs as an ISO 14001 standard, many companies are convinced of their value in controlling the impacts of industries on the environment and producing tangible and intangible benefits. EMS advocates note that the systems are platforms for companies to show they are committed to protecting the environment. Pondeville, Swaen, and De Ronge (2013) assert that most organizations with good environmental protection efforts consider it a competitive advantage for realizing positive operational performance. Others argue that EMSs affect business performance of any organization positively with good environmental performance leading to economic profitability that relates the quality of managing the environment to positive or negative economic growth. Organizations achieve economic returns from the efficient management of waste and resources (Al-Tuwaijri, Christensen & Hughes 2004). Oil and gas companies with good environmental management practices reduce their environmental loads through better planning that EMSs offer. They achieve an economic return from the efficient practices with the systems having spillovers, which encourage extra awareness and good communication. Johnstone and Lebonne (2009) support the institution of comprehensive EMSs and a certification granted an external body to have the added advantage over competitors. Whereas this is not mandatory, the benefits of external certification include confidence that the management meets the recognized industry standards and offers a means for maintaining momentum offering a different perspective for reviewing EMS functions and recognition of organization achievements. Studies also note a twist, arguing that all organizations may not share similar perceptions or share the enthusiasm of EMSs. Other studies (Lopez-Gamero, Molina-Azorin & Claver-Cortes, 2009) dismiss the link between EMSs and productivity, arguing that EMS adoption offers no competitive advantage since the systems are not designed for the purpose. In essence, the failure of most organizations to implement EMSs to their maturity makes the approval complex (Iraldo, Testa & Frey, 2009). Besides, it is argued that EMSs fail to reduce the effects that companies have on the environment but only establish mechanisms for progressing in the direction. Where researchers reveal the cost impact of EMS to be greater than its value in reducing environmental effects, the link between EMSs and environmental innovations is considered insignificant (Ziegler & Nogareda, 2009). Additionally, the lack of evidence for profits linked to voluntary EMS certifications is questionable, meaning that the causal relationship between certified EMS and environmental innovations are challenged. Ammenberg and Hjelm (2002) caution that EMSs certification does not guarantee good environmental performance and should be overlooked to focus on environmental impacts and not implementing certain tools. Wagner (2008) supports the implementation of EMS as a path to clearer objectives than simple EMSs certification. This links to the absence of a significant relationship between certification and measured achievements of certification. Morrow and Rondinelli (2002) affirm that EMS adopters may maintain similar environmental impact levels or increase emissions. The standard does not offer the ceiling and mandatory target for each company, meaning that it does not improve environmental quality. On the other hand, proponents of EMS adoption argue that the rigorous nature of any EMS standard influences the coordination of environmental efforts (Friedman, 2003). Moreover, EMS allows for the strict application of regulations to prove due diligence. Next, the standard improves human work methods and behaviors despite contradictory claims arguing that the ISO 14001 do not align with modern managerial trends. Friedman (2003) argues that it encourages the promotion of employee involvement in consulting environmental issues which shifts from contemporary management based on empower and flexible structures. The costs and drawbacks for implementing the process are cited as significant constraints impeding adoption (Friedman, 2003). In sum, perceptions differ with advantage and disadvantages of EMS implementation and certification being widespread. From the literature, the nature of activities, operational management, and the needs of any organization tip the perceptions that facilitate the implementation of EMSs. The literature review shows that different countries and organizational types may have different motivations for adopting EMSs. Some may be driven by concerns about the environment while others bend to the forces of pressure. Regardless of the reasons, many countries may choose to have their EMSs certified by third parties while others may gain from the catalog of environmental and economic benefits of implementing the systems. The implementation process does not lack drawbacks wit change resistance, system costs, the absence of expertise, the absence of guidance, and organizational structures being the obstacles to achieving a well-functioning system. Managers have to employ different practice measures to ensure their organizations are ready o embrace environmental management systems.Friedman (2003) notes that organizational culture influences EMS adoption, establishment, operation, and maintenance. Stakeholders such as the workforce engaged in implementing the systems play a significant role in the process and with their involvement being essential to the uptake. Despite these, EMS is reported to have significant positive effects on employees who choose to participate in the management system. The literature review helps define the issues need in targeting the pursuit of the aims addressed in the thesis and shape the methodologies to ensure that all the methodological stages of the paper are successful. It also helps shape the data collection process that will facilitate the study of collected data using quantitative surveys. Based on the conducted literature review, this is the best approach for testing EMS variables for the oil and gas industry in Oman. Case studies will add depth to the data that the study collects. The quantitative methods are preferred for studying the problems facing EMS implementation in the oil and gas industry in Oman with the experiences from other industries revealing success factors fitting the country. The literature review has also helped in defining the questions needed for the questionnaire and the documents to target for the study. The knowledge will help in directing critical thinking efforts to ensure that the actual questions cohere with the collected data. The next chapter addresses these issues in detail. The environmental and operational concerns identified in this proposal inspired this dissertation to examine factors hindering effective implementation of EMSs in Oman’s energy sector. The study sought to address the gaps in EMS research to improve environmental and operational performances in the oil and gas sectors and offer recommendations on EMS aspects suiting the energy industry. According to the University of California (2016), the methodology chapter analyzes the generation and collection of data. As such, this section will detail the scientific approaches, methods, and the rationale for why certain research and data collection strategies are used in the paper. The presentations for each stage of the research are outlined and the limitations identified. Besides, the chapter highlights the efforts of the researcher in pursuing reliable and valid methods. The method used in this paper mirrors those of other researchers (Famiyeh, 2005; Al-Abri, 2014) in the quest to find similar data on EMS implementation. To ensure that interview questions met the criteria for the study, the researcher chose a quantitative methodology that could help in understanding the elements required. Choosing the suitable strategy for the research was based on reflections from the literature review, available resources, and the nature of questions. A quantitative methodology was chosen to aid in statistical analysis. The questionnaire, which is the most common tool for collecting quantitative data, was employed and data put into categories of “yes” or “no” answers. The limited nature of the research instrument gave no room for the participants to express more than was needed. Even though the questionnaire risked failing to produce the aspired level of depth and comprehensiveness of data at this stage of the research, Seidman (2013) cites its valuable in gathering information, probing specific issues, and observing the responses of interviewees. The questionnaire instrument was chosen for these notable strengths, which make it useful in gathering information on the research topic. When modelling the questionnaire, the researcher followed the caution of Seidman (2013) and avoided leading interviewees through paths that could introduce bias. Therefore, themes were introduced and each allocated a set of questions that could satisfy the needs of the research. The questionnaire is the most preferred tool for showing the gaps in environmental management practices by comparing them against set standards (Famiyeh, 2005). 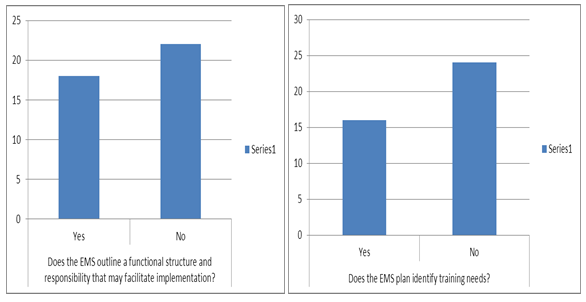 The standard questionnaire reflected a straightforward and short nature that could review the requirements of EMS implementation in Oman. The questions gave Oman Oil Company the opportunity to learn its strengths and weaknesses and identify the areas requiring improvement and those areas, which were deemed right. The questionnaire identified the level of importance that the participants accorded to different themes based on the categories allocated to each score. Exposing the industry to an audit of its EMSs gave it the opportunity to develop its understanding of ISO 14001 and the benefits relating to the corporate environment. The chosen respondents completed the questionnaire during the four-day interaction with the company. The respondents were assured of the confidentiality of collected information and the reporting of collected results in aggregate. To investigate how companies in Oman’s oil and gas industry use EMS in collecting data and informing company decisions, five companies were selected, and the types of EMS they participated in were noted. The five companies were evaluated for their willingness to participate in research, avail environmental information in their websites, exchange information on implemented EMS programs, and participate in a questionnaire with themed questions. Out of the five companies, only one met the criteria of having implemented an EMS successfully, two were at the assessment stage, and the rest were at the compliance stage. Out of the five companies, Oman Oil Company was chosen as the preferable company for understanding the use of EMS in managing emissions, resources, and energy. From the company, the researcher understood the facility’s use of EMSs, the components of their EMS systems, the types of information systems they used, and its value. The case was not selected randomly to avoid bias, which De Bruin, Ballari, and Bregt (2012) consider the selection of useless information with data holes. Therefore, Oman Oil Company was considered a fit for this study because the oil and gas industry is subject to environmental regulations from the numerous challenges it faces. Since Oman Oil Company has an EMS that includes the components of those from other companies, the researcher found it feasible to conduct research on the single facility. Since the company exists in the same industry, we concluded that the industry-wide problems they encounter would mirror those of other facilities. The research sample of 40 employees was collected from Oman Oil Company. The company was chosen for its readiness to volunteer, meaning the validity of the results is based on the company’s willingness to expose their environmental records, and decision processes to the research. Several authors (Varjlejs & Walton, 2009; Al-Khalifa, 2010) support the drawing of interview questions from the literature review as a firm ground for ensuring that the questions deliver the required message and gather data even where further modifications are necessary. The questionnaires were sent to participants actively occupying their positions through mail. A purposive sample was chosen for its ability to help in exploring specific characteristics that aided the findings of the research. However, the research was careful to note that the sample approach was subject to probability bias since it is based on personal judgment in the quest to prove a specific point. This was countered by making decisions based on accepted criteria and not what best supported the study findings. Whereas the chosen sample risked failing to represent the entire population, this was not viewed as a weakness but a choice. The study depended entirely on an expert sample to draw information from their expertise. Moreover, a selection criterion of above two years’ experience within the industry and their involvement with EMS activities within the company was applied. 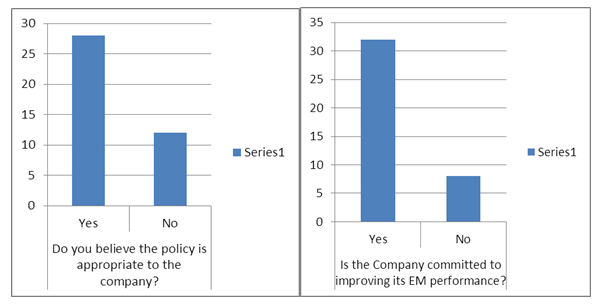 The questionnaire helped in collecting information on the attitudes of employees towards the implementation of EMS. Most of the study limitations for this study occurred at the methodology stage. Perceptions included the view that the measures employed in the study were subjective, labor intensive, subject to researcher bias, and presented difficulties in reproduction and generalization (Anderson, 2010; Baker & Edwards, 2012). Furthermore, close-ended questionnaires are limited by their inflexibility in exploring ideas or generating further comments (Ary, Jacobs, Razavieh & Sorensen, 2009). However, the limitations were avoided by designing the questionnaire with knowledge of the literature review, and making modifications as necessary. Similarly, conducting the research in Oman alone and focusing on a single organization created the limitation of extrapolating the results to other industries and countries. Herein, the aim of the research reduced the effects of the limitations by focusing on the implementation of EMSs in the oil and gas industry in Oman alone. This prevented the spreading of the limitations to the results of the research. The questionnaire only reported what the respondents said, as a view of the real concerns of the company. Overall, the limitations to the study were mitigated and the research allowed to take on its full course. Addressing the concerns of confidentiality and ethics during the early days of any project is critical, especially where people are the main source of information on the tasks (Kaiser, 2009). Before the researcher approached any potential information source, the respondents were contacted by email, letter, or phone call. The introductory information included a statement of assurance on the confidentiality of the information and given that only the researcher will analyze the data for the purpose of the study, it had no effect on the participants in any way. The letter of permission from the Oman Oil Company was attached to the questionnaire to give the respondents a background into the study. This also helped in explaining and gaining their confidence on the anonymity of the research. It was reaffirmed to the respondents by word of mouth that no person other than the supervisor was allowed to see the content of the dissertation. The final written thesis ensured anonymity by keeping off the actual names or characteristics of participants, with the information well-received by participants who proceeded to co-operate well. Wagner (2003) supports the collection of environmental performance data from corporate reports and publicly available information on environmental programs such as toxic release inventory data, program documentation, and occupation health and safety administration statistics. For this study, the researcher collected different literature on environmental programs and EMS performance in Oman to restrict data to this context alone. The data from the EMS sources were collected and analyzed to understand informational access and the stakeholders responsible for various tasks. From the information, we drafted a thorough questionnaire that focused on finding the status of environmental management at Oman Oil Company by gathering data on the elements of the EMS present and the extent to which these were practiced and implemented. The focus also included collecting data on the effects of the current activities and processes at the company to assess the environmental performance of its units and sections (United Nations & the Economic Commission for Europe, 2004; Tinitinalli, Cameron & Holliman, 2010). At this point, the environmental services officers and managers were contacted to verify environmental issues at the company. Included in Appendix 1 is the entire questionnaire. The results of the interview were verified before analysis for completeness. The data collection process also included the impacts of EMS activities on targeted practices. Browsing through the website helped to inquire concerning the observed practices. The data collection processes also focused on identifying the managerial and employee related problems affecting the operational performance of the EMS system. The causes and effects of the issues identified by the organization were investigated, and data on the performance levels and accomplishment of the EMS were deduced from the questionnaire. As a result, data on issues related to the management of EMSs were gathered from interviews. According to Saad, Su, Marsh, and Wu (2015), questions and scales of measurements preferable for any study are those that are selected and adapted from the literature review. At the development level, existing measures define those that were developed in previous studies, composed measures, define those which exist in literature but have items adopted depending on the current research and new measures, defining those which are developed specifically for a particular research. The researcher reviewed the questionnaire and used composed measures to tailor the questionnaire to the current research gaps. Researchers such as Khadour (2010), Hassan (2006), and Seraphim (2006) approve the use of the quantitative methodology in environmental management literature. Therefore, the quantitative method helped in collecting data to investigate the environmental issues at Oman Oil Company. The questionnaire is designed in a way that allows respondents to provide the required information easily. The approach facilitates the investigation of factors critical to environmental management such as challenges facing the Oman industry. 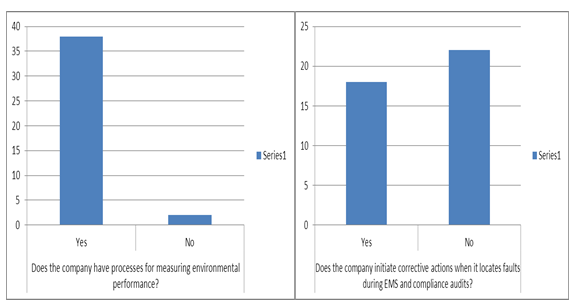 The respondents used the nominal scale of “yes” or “no” to answer questions relating to the implementation of EMSs at Oman Oil Company. Having this simple distinction registered specific and simple feedback to the research questions. According to Pathak (2008), quantitative methods have significantly contributed to research, since they offer ways of examining and interpreting significant patterns and themes. Meaningfulness is only achieved where the results correlate with the goals of the research at hand. The three steps outlined for analyzing data include data reduction, display and conclusion. The nominal “yes” or “no” scale helped in analyzing the data since it eliminated the complexities of reducing data from the questions. The data analysis started early and continued iteratively throughout the data collection process to give a good opportunity for reflecting on the gathered data. Where data does not need the use of software, the data coding process involves organizing the information into themes and categories mirroring the research objectives (Pathak, 2008). The data coding process extracted key themes from the interview questions and compared them to find commonalities and differences. To display the data, sum of each scale was used to identify the relationships between different variables. Data from the company was correlated with information from the interviews to find the matching and mismatching practices. This phase presents and evaluates the data collected from the literature review phase. In the phase, the results of the questionnaire and information on the policies and regulations governing environmental management and the efficiency of EMS tools are analyzed. The questionnaire identifies areas of the EMS tool requiring improvement to comply with set standards. The strengths and weaknesses of the company, industry, and entire country level are analyzed and presented. The results of the modified questionnaire help in retrieving employee knowledge of EMS certification. The questionnaire remained open to all management and employee levels given the ease of the method and the author on call to clarify on perspectives that respondents failed to understand. The study results show that Oman Oil Company has a form of ISO 14001 in place and is certified to it. The table presents the results, which relate to the composition of sampled respondents from Oman Oil Company. The results of Table 1 show the pool of respondents identified from the study. The respondents were questioned about the company’s commitment and policy on EMS, planning, implementation and evaluation to identify the company’s progress in managing the emissions in an environmentally friendly approach. The descriptive analysis of the management of EMS from the company’s 40 responses will show whether Oman Oil Company is acting to protect the environment in an environmentally friendly way. The questionnaire is an instrument commonly used by organizations to identify EMS improvement areas in any organization (Varlejs & Walton, 2009). The study reveals that the organization uses internal assessments to find improvement areas while using third-party audits to identify the progress of EMS implementation. The process includes an initial environmental review of the departments by an environmental manager or department tasked with handling environmental concerns. The review will help the managers to identify areas for potential enhancement within the organization by recognizing the gaps that hinder the effectiveness of the process (Varlejs & Walton, 2009). Furthermore, Oman Oil Company uses internal assessments to comprehend their position about legislative and regulatory requirements. Below are the themes selected to help the study in investigating the research objectives. At Oman Oil Company, EMS onlys act as a strategic improvement tool where annual goals and policies are established to encourage its view as a long term strategic discipline meant to be achieved with the support of resources and maintained concentration. This theme required an analysis of the environmental policy of the company, its presence and appropriateness to the business. The theme also required an analysis of commitment included in the policy such as the prevention of pollution, compliance, and constant improvement of its EM performance. This helped in analyzing whether the policy is committed to reducing risks facing the environment. Detailed below is a representation of the results drawn from the questionnaire. Questions on commitment and policy were the first step to identifying areas in the company that required significant improvements. From the descriptive analysis, it is clear that Oman Oil Company has engaged efforts towards improving its EM performance as indicated by its commitment to preventing pollutant emissions from the company. The company affords much focus to its environmental aspects with many agreeing that its progress to cleaner technologies and compliance is a sign of the commitment. This excellent commitment towards improving EM performance links to the company’s focus on monitoring the progress throughout the implementation stage. This aspect brings out the value of conducting regular internal audits and comparing them against monthly economic returns as critical to monitoring the progress of EM performance. The policy laid down is most appropriate to manage the EMS system where the company engages in responsible care for its environment. Majority of those who disagreed with the appropriateness of the policy for the company cited the poor commitment towards minimizing health and environment risk exposure. The responses were mainly drawn from the employees’ end and could be attributed to personnel level concerns such as the absence of appropriate gear and better working conditions considering employee well-being. According to Tinitinalli, Cameron and Holliman (2010), this is a major risk to human and environmental health and safety that shows little support to the green efforts that may help in preserving the environment or human life. This is a great impediment to the visionary focus of Oman Oil Company, which has made considerable efforts to manage its environment issues and to update its EMS. The appropriateness of the company’s policy gives weight to effective procedures that may facilitate the company’s progress at monitoring and measuring key aspects of its operations. The company should engage in monitoring and measuring the characteristics of the operations and activities with significant effects on the environment before using these in tracking the performance. Top on its agenda should be effectively documenting procedures for ensuring compliance when evaluating its environmental requirements. This affirms the need for procedures describing the company’s efforts at monitoring and measuring essential aspects of EMSs. The company requires these characteristics in its operations and activities since they affect regular environmental monitoring and performance. 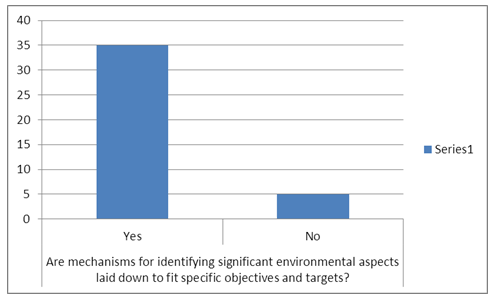 Next, the questionnaire sought to identify whether mechanisms for identifying significant environmental aspects were laid down to fit specific objectives and targets. Oman Oil Company has established environmental management programs to help achieve its targets and objectives. The programs have detailed plans explaining the path to achieving the set goals and targets. The EMS program also has specific, prioritized actions for handling processes relating the establishment of environmentally significant aspects, objectives, and targets. In essence, the program seems to reflect the company’s overall environmental policy. The EMS Implementation Plan at Oman Oil Company points to the overwhelming response on the presence of mechanisms used to identify the environmental aspects fitting specific targets and objectives. The plan includes periodic milestones to be implemented during each period and delivery plans for all significant aspects and activities that facilitate meaningful performance measurement. The review is documented to address the requirement for changes to the EMS. Oman Oil Company knows that an environmental audit is the basic means of identifying opportunities for improving environmental performance, and encourages staff in ways that may conducively improve environmental performance. However, the reviews are not organized or structured in ways that demonstrate all the elements of the EMS, the completed aspects, and those under contemplation. Formalized procedures outlining review, approval, and revision controls are not fully developed. The absence of this formalization increases risks of using outdated information in developing, reviewing, approving, and maintaining the EMSs. These weaknesses need to be capitalized to create opportunities for strengths that may facilitate the EMS course already initiated. Periodic reviews are important mechanisms needed to improve the EMS with the intention of uplifting the environmental performance of Oman Oil Company. The reviews are more than mechanisms for identifying the cohesion between environmental aspects fitting specific objectives and targets since they identify their environmental implications. The managers are aware that environmental reviews may help find opportunities for improving environmental performance. The company shows this positivity by supporting the prevention of pollutant emissions and the socially responsible disposal of hazardous materials focusing on environmental aspects. The company also gives employees the opportunity to engage in checks and revisions of legal and statutory controls that may hinder performance. The indications point towards a positive engagement of the firm with the environment and capitalization of the weaknesses to make the system firm. The results of the study show that the company has an above average commitment to EMS at all levels. The company is attentive to the various sub-elements of its implementation need to facilitate effective implementation of the EMS. The implementation phase is critical to any EMS system and requires keen detail to ensure that all is fully operational. The questionnaire targeted the structure of the company facilitating EMS implementation, the ability of the plan to facilitate training, the presence of operational control procedures, and a well-communicated emergency plan to ascertain the preparedness of the company. These aspects allowed the researcher to identify the factors facilitating EMS uptake at Oman Oil Company. The company may have all EMS requirements well documented, yet, its functional structure and responsibility only facilitates partially implementation, which is achieving little success with the company. Evidence of this is found in the chart below. Also outlined the next chart is recurring theme to develop a comprehensive training strategy that recognizes the training needs of employees. Having this laid down has the possibility of coordinating training activities within departments. Currently, little of this is put into practice, given the inability of the EMS plan to identify training needs of employees effectively. Moreover, this assertion suggests that Oman Oil Company lacks planning strategies for training employees on environmental protection methods. Where employees are unaware of these concerns, a rework the education and training needs of employees on EMSs is needed. Contrastively, the structure of environmental management at Oman Oil Company is well established to identify the potential accidents and emergencies. The company has also laid out the responsibilities of employees in its emergency plans and procedures. This has been tested and is well communicated to help the company in implementing the EMS. The structure is often reviewed and revised to ensure they are updated at each implementation stage. Furthermore, the procedures feature periodic tests where applicable and are consistently followed. Oman Oil Company is competent at the implementation stage since it has enough human, physical, and financial resources that are effective for managing the environment and operating the EMS. This shows that the support mechanisms for implementing the operational control procedures of the EMS are well documented at the present. This allows Oman Oil Company to meet the targets and goals of its environmental policy. The lines of communication in this aspect are well documented to manage environmental operations and activities according to its policies and objectives. This allows the organization to identify potential emergencies and carry out procedures for preventing or responding to these concerns. However, the margins for the EMS are tight with respect to training and functional structures facilitating the uptake. After identifying the potential gaps from commitment and policy, planning and implementation, this study moves to the evaluation stage, which is critical to the failure or success of any plan. This section of the interview builds upon the results of the responses from the top management, environmental managers and employees on evaluating performance, ensuring compliance, auditing the EMS, and initiating corrective action on identified system gaps. The role of evaluation in measuring the progress made after executing the system will help explain the procedural changes to improvement plans and procedures. This step becomes significant where the implementation stage changes operational methodology or implements new technology. 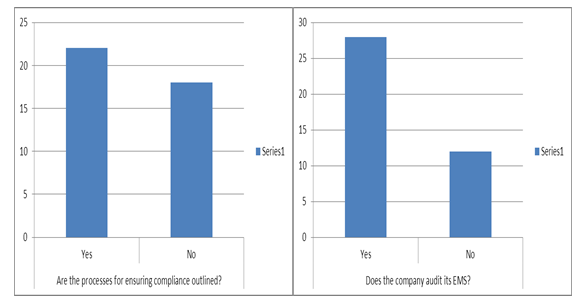 The study results show that processes for confirming or rejecting the findings of the internal audits are well laid as indicated in the below chart. At this point, the measurement of environmental performance is not to obtain accreditation to the ISO 14001 standard but is a step towards formal EMS certification. The study results also show that Oman Oil Company has perfect procedures laid out to audit the company’s performance. The company performs EMS audits regularly to make sure that the system works out as planned and to give more information for making internal audits. The company implements, reviews, and consistently follows the procedures laid out for carrying out periodic audits. The results of the investigation into these processes are detailed below. Whereas the results of the study show that the company has well-instituted processes for measuring compliance and an audit system that guides the implementation process on relative gaps, the programs fail to cover all EMS aspects comprehensively. It is necessary to review the consensus on numerous aspects of the evaluation process to allocate appropriate attention to the necessary evaluation aspects. Presently, several aspects of the EMS implementation process score above the fifty percent mark. However, this is insufficient in an environment that demands perfection in handling health risks to employees and the community. Oman Oil Company needs to proceed aggressively to work out all the aspect of its EMS plan. Key areas requiring attention include auditing the company’s training, awareness, and competence periodically to show the extent of the company’s commitment to the public and the procedures for identifying the environmental training needs of employees. The study results show that the processes for measuring environmental performance are well laid to help the company in taking corrective actions on areas where it finds faults. The company is however, faulted for lacking the capacity to initiate corrective actions even though the faults are identified. Since the internal managers will confirm the improvements made from the new methods, it is necessary to ascertain whether the processes for measuring environmental performance or ensuring compliance are detailed. Measuring performance and initiating corrective actions have to work alongside the other for Oman Oil Company to achieve the success it requires in implementing the EMS. The challenges that Oman Oil Company faces make intervention necessary. The study identifies environmental practices that may affect the environment and the health of employees in the short term while an accumulation of these effects may have long term effects. The inadequate environmental management links to the undesirable environmental performance and requires mitigation at the control and management level to eliminate the adverse effects and to enhance implementation efforts. The operational performance of the company is below standard from the managerial and organizational shortfalls that it faces. This shows a link between organizational and operational aspects of the industry and its environmental performance. In light of these concerns, the following guideline recommendations are proposed for Oman Oil Company and could be used by the energy industry to streamline its environmental practices. All the activities, facilities, and services at Oman Oil Company need to be reviewed and audited using a specialist to assess their value to compliance. The results of the audit review reveal that the process should involve all personnel to identify the materials that their activities require, the environmental aspects they are involved in, and the environmental impacts of their work. The review at Oman Oil Company should detail faulty machinery, poor practices, and system failures because they are the factors that require the most effort. Poksinska, Dahlgaard, and Eklund (2003) affirm this assertion by insisting that identifying environmental aspects early gets people involved, allows them to scrutinize their jobs, and breaks down tasks according to what they involve and how best to conduct the tasks. The management of Oman Oil Company will gain from identifying the problems and challenges to specific areas of the establishment. This will help managers get involved in the foundational phase, draw them close to the tasks performed while acknowledging the needs of every load and process. Jørgensen, Mellado and Remme (2004) affirm that policies stressing on the commitment of the top management to the systems and its target goals should be clearly stated and distributed. From the data analysis, setting policies will drive better environmental management in the quest to make an entire system comprehensive. A clearly defined policy will keep the focus of employees on set goals while displaying the company’s commitment towards continually improving environmental performance. The policy of Oman Oil Company should actively support environmental ownership as a top priority for its managers while delivering the resources needed to support the stated goals. Furthermore, goals should be included as indicators of a final performance level that allows Oman Oil Company to see what they need to meet set targets within a period. Knowing the end product and time limits will keep determination alive while mitigating the obstacles and locating the resources necessary to achieve the set goals. Klemmensen (2007) points out that full compliance with regulatory requirements should be the aim of any implementation process to create a learning organization and to increase environmental awareness. The study results affirm that all government legislation linked to the company’s environment should be reviewed and comprehensive inventory built. The Ministry of Environment should help by supplying further information and explaining the regulations governing each energy company. At Oman Oil Company, the regulations should link to the pollutant activities of the company. Liaison between the ministry of environment and the company is essential to establishing a solid basis for the system while informing them of the company’s intention to get advice and constant support. Consolidating the external communication links should be a priority for any business. The ability of regulatory bodies to regulate the energy industry and counter the adverse effects of industrial pollution is voiced throughout the study. These legislations have pushed forward the uptake of EMSs voluntarily, despite compliance remaining a major concern that EMSs should satisfy. Alabri (2014) supports that examining the role of Oman’s Government and the challenges it faces in its efforts to combat pollution reveals gaps in environmental legislation that may prevent the government from realizing its goal. The Oman government has to step up its monitoring of the energy industry by encouraging a commitment towards environmental management. Currently, the government efforts are diluted by the inadequacy of environmental proactivity and administration of the energy sector as the study results show. Therefore, recommendations are necessary to counter the issues hindering effective and efficient implementation of EMSs in the energy industry. When initiating change management to ensure that operation processes conform to the systems, Oman Oil Company should avoid making significant alterations since it takes time for employees to be acquainted with a new change. Schylander and Martinuzzi (2007) insist that large-scale shifts such as new organizational structures as well as positional and role shuffles may create unrest and confusion and should be integrated progressively into the organization. Having environmental champions with a permanent link to the requirements and progress of the systems is valuable to systematic enforcement of the primary implementation targets. The roles allows for continuous and simultaneous supervision of environmental aspects within the company and the energy industry while giving room for the correction and reporting of violations. During change management, the company’s administration should look at communication as a critical aspect. The administration of Oman Oil Company should use all available communication methods to disseminate knowledge of the new system and environmental issues to all concerned stakeholders (Rao, 2010). Issues of policy, targets, goals, problems, and solutions should be given keen consideration by the management with top level interest communicated at all levels. The administration of energy companies should clarify their ideas before communicating any shortfalls, should examine the communication process, have an understanding of the environment, consult with others in communication planning, and consider the message contents carefully. Communication should be followed up to make it effective in the short and long term, the actions must align with communicated principles, and the communicators should embody excellent listening skills. Communication is an important facet to getting the buy-in of employees, driving continuous feedback to support new system goals, and ensuring that all communication channels within the organization is utilized. Fiorino (2006) asserts that the capacity for learning has less value where the capacity to change behavior according to the lessons learned is absent. Training is needed for the management and supervisory levels of Oman Oil Company to increase knowledge and awareness of environmental concerns. Awareness courses on the activities of junior employees are also needed. The assumption is that all organizational entrants, junior employees, and those eyeing leadership positions should undergo courses on environmental protection and prevention of pollutions. These findings concur with literature voicing the opinion that environmental awareness has to touch all the employees’ lives to ensure that they are equipped with environmental values aligning with the creation of a stable management system. The move will reduce the pollution burdens of the company’s services without much operational control and discipline. Operational control at Oman Oil Company is currently weak and hindering ratification that may only occur where environmental operations are under constant scrutiny. The control of activities and individual tasks should be comprehensive and their impacts on the environment identified before being conducted carefully. Smith (2005) agrees that operations that may affect the company significantly should be carefully given extra care with supervisors practicing close control of the processes, while advising, and directing as they see fit. Companies in the energy industry should deal with any environmental violations causing negligence and complacency by preventing adherence to environmental management. This is critical to ensuring strict and firm operational control within the industry. Perotto, Canziani, Marchesi and Butelli (2008) asset that raw data is needed to correctly evaluate environmental performance. However, care should be practiced to give the results meaning and uncertainty assessed to avoid misleading measurements. Monitoring at Oman Oil Company needs to cover issues behind emissions to operational characteristics such as input materials and output waste and quality. The data is essential to managing the systems and equipment as well as techniques such as Environmental Accounting and Cleaner Production, which relate to process and product management need to be considered. Periodic internal audits should be a priority of the top management at Oman Oil Company during the initial implementation stages of EMSs as part of its Monitoring and measurement efforts. The audits should also cover personnel, procedures, documentation and practices to ensure progress according to set plans. The sessions are valuable in identifying the issues that the company encounters and the progress made in meeting the unit targets. Overall, the energy industry as well as the company should seriously consider the audits and their outcomes and use them in making short-term targets while correcting shortfalls that may be affecting long-term objectives. Similarly, Abdullah and Fuong (2010) point out that the short-term targets should aim at increasing achievements in specific procedural, personnel, and production aspects in the quest for set goals. The specific and measurable goals should consider the available resources and manpower with the companies paying attention and setting the targets in their absolute terms. Manuela and Clara (2003) concur with the argument that poorly defined, communicated and understood objectives only create a confused and inadequate system that wastes human, material, and financial resources. Therefore, the energy industry needs to assess its goals based on its mission, long and short term strategies, its financial capabilities, performance monitoring, and investigation of output process. The targets should link to measurable causes and practices while taking the present management conditions and awareness level into account. Voluntary EMSs are tools that industries and companies can use to complement the international and national environmental legislations. This study has highlighted the benefits of the system as exceeding environmental achievements to create advantages to the economy of any organization. This study uncovers the factors that may encourage the success of the EMS tool while helping maintain continuous improvements to ensure that the implementation of EMSs succeed in providing environmental and operational improvements and prevent the failure and collapse associated with management aspects. Proactive measures are proposed to complement and advocate for the EMS elements such as top management commitment, provisions for maximum employee involvements based on operational enhancements, and inclusive participation in planning and implementation of EMSs. This will optimize care and encourage the sense of ownership that the system demands in training, creating awareness and communicating EMS aspects within the company. Proactivity will affect any organization positively and help it in embracing change to lead to better EMS implementation. For Oman Oil Company, the best implementation pace that may eliminate the hindrances is following a well-planned, phased and gradual approach guided and advised by external expertise. This will help educate the company on the best ways to utilize its facilities and available organizational structure. The pace allows the company to set major phase targets, gives it time to get buy-in across all employee levels, and allows it to adapt the organization to the systems while improving different aspects of the process. Besides, employee involvement and proactive participation in all the stages of planning and implementation is needed at the early stages. The involvement may have a direct positive influence on the working culture while improving environmental management. Controlling both the aspects positively will help the organization achieve the required benefits. Alongside the required training and awareness programs, any company with internal training facilities should help grow responsible and environmentally oriented personnel who embody the right values and cultures needed for service. The educational method will prove to be successful in nurturing the right principles and culture needed at the company. From this will flow environmental care and operational awareness as a norm meant to bring out the benefits of environmental and performance improvements. Besides, equipping employees with the right values, behaviors and attitudes will directly and positively influence the working culture of the organization. With the measures and variables implemented appropriately, strict operational control and policing according to the EMS guidance and targets has to be practiced. This will create necessary managerial responsibilities while giving room for disciplinary actions and incentive rewards to facilitate the rigidity of adhering to systems. Surging on towards certification of the system is a long-term strategic target meant to increase and maintain the interest and drive of the top management. Any energy company facing operational and environmental challenges should follow these recommendations to ensure that the organization accepts and embraces the benefits of the change. These environmental and operational benefits will lead to financial benefits for the company. This study asserts strongly that these recommendations are applicable to any company with enabling factors such as proactivity measures and employee involvement schemes being necessary. This chapter uses the results of the previous phases of the research to draw out conclusions and implications of the study to Oman Oil Company. The section agrees that Oman Oil Company can use EMS as a strategic tool for initiating considerable environmental and operational improvements. The assumption of the section is that the shortfalls of Oman Oil Company can be overcome after they are identified and that environmental research could enhance these findings by considering different aspects. The bulk of literatures on EMS implementation in Oman is mostly empirical, with the studies lacking the required depth needed to make judgment on the concerns. Whereas the results, which present statistical relationships are important, more qualitative research may help eradicate the ambiguity surrounding the EMS elements. Qualitative research is also needed to uncover other factors that may encourage effective implementation of EMSs and sustain its implementation. These should be investigated in successive studies by looking at successful international studies and investigating the home energy industries. The lessons from the case studies will help inform the research findings with the recommendations drawn from these studies facilitating the adoption of EMSs as strategic tools for improving environmental and operational performance. Next, the success of adopting the proposed model requires collaboration between stakeholders with a clear understanding of how the system operates to eliminate possible barriers. Numerous questions remain unanswered on the future of environmental management in Oman and the responsibility of various stakeholders. For example, the role of the public, what inhibits the effectiveness of these stakeholders, or their contributions remain neglected. The progress of other industries with the environment and their level of focus on environmental management, the role of the media and its weak involvement, and how other stakeholders such as activists, the media, industry drivers and decision-makers can raise the public’s awareness on environmental protection remain largely underexplored. Overall, this research offers the foundations for conducting in-depth studies on the effective measures that the government can improve to increase environmental protection. Research may also cover the effects of gradual compliance rather the than quick purchase of systems and the effects of internally grooming employees on environmental protection as compared to standard training. Future research could help expound on the factors facilitating the success of implementation not covered herein, and those that may be incorporated into the model to make the results more productive. Studies could investigate the quantitative interactions and relationships linking these factors. Provides information on EMS implementation at Oman Oil Company and identifies crucial elements aiding or hindering its success and highlight the strengths and weaknesses of these elements to which any company can study and gain in-depth insight. Offers an environmental management exposure that allows Oman Oil Company to assess its management of environmental concerns while assisting them to look ahead and make necessary plans for changes. This is intended to help the company minimize its environment exposure, which is a broad concern for the oil and gas industry in Oman. These objectives will allow any company in the oil industry to identify its level of environmental emissions and compare them with the levels prescribed in disposal regulations and minimum levels. Key areas for improvement can also be drawn from this study. Still, the limitations have to be considered before information in this study is applied to companies at different levels of EMS uptake, other industries, and other countries outside the context of Oman. Alabri, A. M. O. (2014). Assessing the Need for the Adoption of Operational and Environmental Performance Systems in Omani Shipyards. Portsmouth, England: University of Portsmouth. Al-Tuwaijri, S. A., Christensen, T. E., Hughes II, K. E. (2004). The relations among environmental disclosure, environmental performance, and economic performance: a simultaneous equations approach. Accounting, Organisations and Society, 29, 447-471. Alvesson, M. (2002). Understanding Organizational Culture. London, GBR: Sage Publications Ltd.
Ammenberg, J., & Hjelm, O. (2002). The connection between environmental management systems and continual environmental performance improvements. International Journal of Corporate Sustainability Corporate Environmental strategy, 9, 183-192. Anderson, C. (2010). Presenting and Evaluating Qualitative Research. Am J Pharm Educ., 74(8), 141. Ary, D., Jacobs, L. C., Razavieh, A. & Sorensen, C. K. (2009). Introduction to Research in Education. Boston, Massacusetts: Cengage Learning. Baker, S. E. & Edwards, R. (2012). How many qualitative interviews is enough? National Centre for Research Methods Review Paper, 1-42. Balzarova, M. A., Castka, P., Bamber, C. J., Sharp, J. M. (2006). How organisational culture impacts on the implementation of IS)14001:1996 – a UK multiple case view. Journal of Manufacturing Technology, 17 (1), 89-103. Berrone, P., Luis R., & Gomez-Mejia, L. R. (2009). Environmental Performance and Executive Compensation: An Integrated AgencyInstitutional Perspective. Academy of Management Journal, 52 (1), 103-126. Blackburn, W. R. (2007). Sustainability Handbook: The Complete Management Guide to Achieving Social Economic and Environmental Responsibility [Electronic version]. London, GBR: Earthscan. Chan, E. S. W. (2008). Barriers to EMS in the hotel industry. International Journal of Hospitality Management, 27, 187-196. Christini, G., Fetsko, M. & Hendrickson, C. (2004). Environmental Management Systems and ISO 14001 Certification for Construction Firms. Journal of Construction Engineering and Management, 130(3), 330- 336. Davorin, M. (2013). Risk Analysis for Prevention of Hazardous Situations in Petroleum and Natural Gas Engineering. Pennsylvania, United States: IGI Global. De Bruin, S., Ballari, D. & Bregt, A. K. (2012). Where and When Should Sensors Move? Sampling Using the Expected Value of Information. Sensors (Basel), 12(12), 16274–16290. Elshorbagy, W. (2005). Overview of Marine Pollution in the Arabian Gulf with Emphasis on Pollutant Transport Modeling. United Arab Emirates: United Arab Emirates University. Esty, D. C., & Winston, A. S. (2006). Green to Gold: How Smart Companies Use Environmental Strategy to Innovate, Create Value, and Build Competitive Advantage. New Haven, CT, USA: Yale University Press. Famiyeh, S. (2005). An Investigation into the extent of environmental commitment in the Ghanaian economy and strategic policy recommendations. Thesis at the Technical University of Freiberg, Germany, 21/10/05. Galdeano-Gomez, E., Cespedes-Lorente, J., & Martinez-del-Rio, J. (2008). Environmental performance and spillover effects on productivity: Evidence from horticulture firms. Journal of Environmental Management, 88, 1552-1561. Gonzalez-Benito, J., & Gonzalez-Benito, O. (2004). A study of motivations for the environmental transformation of companies. Industrial Marketing Management, 34, 462-475. Gonzalez-Benito, J., Lannelongue, G., & Queiruga, D. (2011). Stakeholders and environmental management systems: a synergistic influence on environmental imbalance. Journal of Cleaner Production, 19, 1622-1630. Hassan O. (2006). An integrated management approachto designing sustainable buildings. Journal of Environmental Assessment Policy and Management, 8, 223–251. Helms-Mills, J. (2008). Understanding Organizational Change. Florence, KY, USA: Routledge. Hilyard, J. (2008). 2008 International Petroleum Encyclopedia. Tulsa, Oklahoma: PennWell Books. Hottentot, I. J. (2006). Successful implementation of an environmental management system based on ISO14001 at major Oil Company in Nigeria. Paper presented at the 9th Annual EMAN Conference Environmental Management Accounting and Cleaner Production, Graz, Austria. International Business Publications (2009). Oman Economic and Development Strategy Handbook. United States of America: International Business Publications. Iraldo, F., Testa, F., & Frey, M. (2009). Is an environmental management system able to influence environmental and competitive performance? The case of the eco-management and audit scheme (EMAS) in the European Union. Journal of Cleaner production, 17, 1444-1452. Johnstone, N., & Labonne, J. (2009). Why do manufacturing facilities introduce environmental management systems? Improving and/or signalling performance. Ecological Economics, 68, 719-730. Jørgensen, T, H., Mellado, M. D. & Remmen, A. (2004). Integrated management systems. Department of Development and Planning, Aalborg University, Working Paper 7, 2-20. Jukneviciute, L., Liubiniene, V., & Thunqvist, D. P. (2011). The Role of Media in Transforming Outlooks on Environmental Issues. A Comparative Study of Lithuania and Sweden. Social Sceinces, 3(73), 25-37. Kaiser, K. (2009). Protecting Respondent Confidentiality in Qualitative Research. Qual Health Res., 19(11), 1632–1641. Karapetrovic, S., & Casadesus, M. (2009). Implementing environmental with other standardized management systems: scope, sequence, time and integration. Journal of Cleaner Production, 17, 533-540. Khadour L. (2010). Total quality environmental management (TQEM) framework towards sustainability (UK Novated D&B Principal Contractors), PhD Thesis. Nottingham: Trent University. Kjaerheim, G. (2005). Cleaner production and sustainability. Journal of Cleaner Production, 13, 329-339. Klemmensen, B. (2007). Environmental Policy: Legal and Economic Instruments. Uppsala University, Sweden: Baltic University Press. Laboy-Nieves, E. N., Schaffner, F. C., Abdelhadi, A. & Goosen, M. F. A. (2008). Environmental Management, Sustainable Development and Human Health. Boca Raton, United States of America: CRC Press. Lopez-Gamero, M. D., Molina-Azorin, J. F., & Claver-Cortes, E. (2009). The whole relationship between environmental variables and firm performance: competitive advantage and firm resources as mediator variables. Journal of Environmental Management, 90, 3110-3121. Malmborg, A. (2004). ISO 14001 in Uruguay – Problems and opportunities. Final thesis on the Master Programme in Business Administration, given at SLU (Swedish Univesrity of Agricultural Science. Manuela, P.V. and Clara, M.F. (2003). Resistance to change: A literature review and empirical study. Management Decision, 41(2), 148 – 155. Morrow, D., & Rondinelli, D. (2002). Adopting corporate environmental management systems: motivations and results of ISO 14001 and EMAS certification. European Management Journal, 20, 159-171. Neumayer, E. & Perkins, R. (2004). What explains the uneven take-up of ISO 14001 at the global level? A panel-data analysis. Environment and Planning, 36, 823 – 839. Pathak, R. P. (2008). Methodology of Educational Research. New Delhi, Delhi, India: Atlantic Publishers & Dist. Pickerill, J. (2003). Cyber-protest: Environmental Activism Online. New York: Massachusetts University Press. Poksinska, B., Dahlgaard, J. J., & Eklund, J. A. E. (2003). Implementing ISO 14000 in Sweden: motives, benefits and comparisons with ISO 9000. International Journal of quality & Reliability Management, 20 (5), 585-606. Pondeville, S., Swaen, V., & De Rongé, Y. (2013). Environmental management control systems: The role of contextual and strategic factors. Management Accounting Research, 12 July 2013. Ramos, T. B., Alves, I., Subtil, R. & de Melo, J. J. (2007). Environmental performance policy indicators for the public sector: The case of the defence sector. Journal of Environmental Management, 82 (4), 410-432. Rao, P. S. (2010). Organisational Behaviour [Electronic version]. Mumbai, IND: Himalaya Publishing House. Saad, A., Su, D., Marsh, P. & Wu, Z. (2015). Investigating Environmental Management and Quality Management Issues in the Libyan Food Industry. British Journal of Economics, Management & Trade, 9(3), 1-16. Samuel, P.S. and Bo, E. (2007). ISO14001 as a driving force for sustainable development and value creation. The TQM Magazine, 19(5), 468 – 482. Schylander, E.; Martinuzzi, A. (2007). ISO 14001 – Experiences, effects and future challenges; A national study in Austria, Business Strategy and the Environment, 16(2), 133–147. Seidman, I. (2013). Interviewing as Qualitative Research: A Guide for Researchers in Education and the Social Sciences. New York, United States of America: Teachers College Press. Seraphim D. (2006). Implementing TQM principles in a construction company in the U. A. E. Ph.D Thesis, University of South Wales, Wales, United Kingdom. Smith, I. (2005). Continuing professional development and workplace learning 13 Resistance to change – recognition and response. Library Management, 26(9), 519-522. Steger, U. (2000). Environmental Management Systems: Empirical Evidence and Further Perspectives. European Management Journal, 18(1), 23-37. Stokols, D., & Montero, M. (2002). Toward and environmental psychology of the Internet. In R. B. Bechtel, A. Churchman (eds.) Handbook of Environmental Psychology. New York: John Wiley and Sons, pp. 661-675. Tinitinalli, J. E., Cameron, P. & Holliman, J. (2010). EMS: A Practical Global Guidebook. Shelton, CT, United States of America: PMPH-USA. United Nations and the Economic Commission for Europe (2004). Environmental Performance Reviews: Bosnia and Herzegovina. Geneva, Switzerland, United Nations Publications. University of Southern California (2016). Organizing Your Social Sciences Research Paper: 6. the Methodology. Los Angeles, CA, United States. University of Southern California. Varlejs, J. & Walton, G. (2009). Strategies for Regenerating the Library and Information Professions. Eighth World Conference on Continuing Professional Development and Workplace Learning for the Library and Information Professions, 18-20 August 2009, Bologna, Italy. Wagner, M. (2008). Empirical influence of environmental management on innovation: evidence from Europe. Ecological Economics, 66, 392-402. Wiengarten, F., Pagell, M., & Fynes, B. (2013). ISO 14000 certification and investments in environmental supply chain management practices: identifying differences in motivation and adoption levels between Western European and North American companies. Journal of Cleaner Production, 56, 18-28. Zeigler, A., & Nogareda, J. S. (2009). Environmental management systems and technological environmental innovations: exploring the causal relationship. Research Policy, 38, 855-893. Zutshi, A. & Sohal, A. S. (2004). Adoption and maintenance of environmental management systems: critical success factors. Management of Environmental Quality: An International Journal, 15(4), 399-419. Zutshi, A., & Sohal, A. (2004). A study of the environmental management system (EMS) adoption process within the Australian organisations – 2. Role of stakeholders. Technovation, 24, 371- 386. Does the company have a well-established environmental policy? If yes, do you believe the policy fits the company? Are commitments such as preventing pollution, using green technologies, compliance or constant EM improvement included in the policy? Is the policy committed to minimizing health and environment risk exposure? Are mechanisms for identifying important environmental aspects laid down to fit specific objectives and aims? If yes, does the company continually seek legal and statutory controls fitting its EMS elements? If yes, does the company review its product designs to identify its environmental implications? If yes, does the company evaluate the risks of its products and equipment before use? Does the EMS outline a functional structure and responsibility that may facilitate implementation? Does the EMS plan identify training needs? Are operational control procedures relating to the EMS established? Has the company established an emergency plan that is well-communicated externally and internally? Does the company have processes for measuring environmental performance? Are the processes for guaranteeing compliance outlined? Does the company audit its EMS? Does the company initiate corrective actions when it locates faults during EMS and compliance audits?